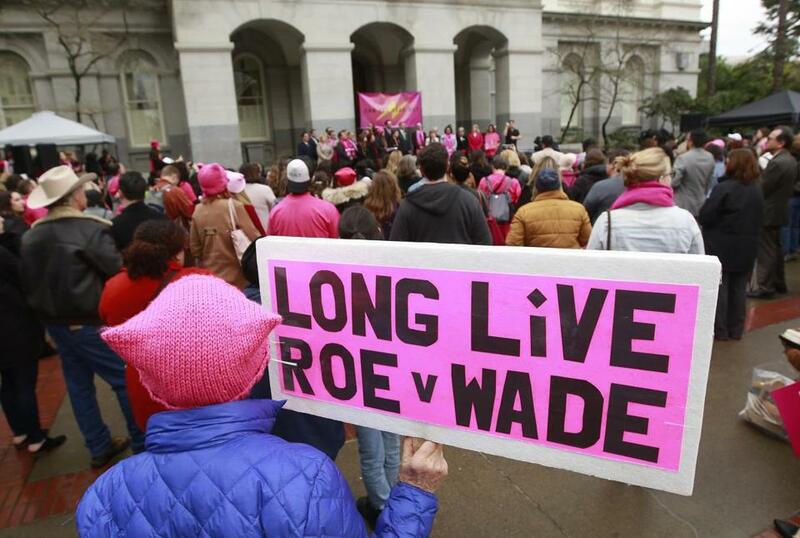 A sign supporting Roe v. Wade appeared at a Planned Parenthood rally on Jan. 22 in Sacramento, Calif., which marked the 45th anniversary of the landmark decision. A BILL PASSED by the Iowa state Senate last month marks the latest skirmish in the right-wing war on abortion rights in this country. The Republican-controlled body approved legislation that would ban abortions after a fetal heartbeat is detected — as early as six weeks into a pregnancy. The bill calls for harsh penalties for any doctor who performs a nonemergency abortion after a fetal heartbeat has been detected: up to five years in prison for committing what would be a Class D felony. Right now, the measure faces an uncertain future in the Iowa House, which is also dominated by Republicans, in part because the end of the legislative session is near. The bill’s sponsor, Iowa state Senator Amy Sinclair, said the measure “gets at the very heart and soul of what it means to be an American, of what it means to be a person.” But in reality, the heart and soul of her bill strips away that eminently American right: freedom to make the most essential choices about reproductive health care. Iowa isn’t alone in this red-state march to block a woman’s right to choose a safe and legal abortion. GOP lawmakers have also passed heartbeat bans in Arkansas and North Dakota — fortunately, federal courts blocked the laws in both states, and the US Supreme Court declined to hear appeals. (It’s also worth noting the alarming shortage of available clinics. One of the plaintiffs in the 2015 case in North Dakota, the Red River Women’s Clinic, was the sole abortion provider in the entire state.) Earlier this year, Mississippi passed a 15-week ban. These campaigns are part of a continuing effort at the state level to set up a potential challenge to the US Supreme Court’s landmark Roe v. Wade decision, which has been the law of the land since 1973. With 32 state legislatures now under GOP control, “if there are any more shifts to the right, you really are talking about a total abortion ban,” said Elizabeth Nash, senior state issues manager for the Guttmacher Institute, a research group that supports abortion rights. The law banned abortions when a fetal heartbeat can be detected, which can be as early as six weeks into a pregnancy. On the right, the push for very early bans is a smart political gambit because it makes other abortion restrictions look downright moderate in comparison. A prime example: In late 2016, Governor John Kasich of Ohio, a red-meat Republican who is reportedly weighing a primary challenge to Donald Trump in 2020, vetoed a six-week ban and instead signed a 20-week ban — a savvy move, because the 20-week ban has been upheld by courts in other states. But it’s noteworthy that the Roe decision held that abortions are permissible until the fetus is viable outside the mother’s womb — now considered to occur at about 24 weeks. That benchmark should hold. Other cases moving through the court system involve bans on certain methods used by abortion providers — so-called D&E (dilation and evacuation) bans, a procedure commonly used in second-trimester abortions. Two states — Mississippi and West Virginia — now have D&E bans, according to Guttmacher, and others are working their way through court challenges. D&E legislation takes its cue from the “partial-birth abortion” playbook, with gruesome descriptions designed to stigmatize providers and patients. While the composition of the US Supreme Court is critical to the future of Roe, so is the state-by-state battle to maintain reasonable access to legal abortion. It’s yet another reminder that every vote, in every election, counts.